A computer class at San Jose, a rural secondary school in La Ceja del Tambo, Antioquia, Colombia. Releasing new statistics today, the United Nations International Telecommunications Union (ITU) announced that by end 2014, there will be nearly three billion Internet users – two-thirds of them from the developing world – with mobile-broadband penetration approaching 32 per cent. Brahima Sanou, the Director of ITU’s Telecommunication Development Bureau, touted this newest record as a watershed moment in the world’s growing affinity for ICT. Internet users, according to the ITU report, are expected to hit 3 billion by the end of 2014, which accounts for about 40 per cent of the world’s population. Among those users, over three quarters are from developed countries while two-thirds come from the developing world. Moreover, people from developing countries make up for more than 90 per cent of those who are not yet using the Internet. In Africa, about one-fifth of the population will have access to the Internet; while in the Americas, nearly two-thirds of the population will be online by the end of the year. Further, Europe has the highest Internet penetration rate of 75 per cent, while the Asia-Pacific region has the largest population of Internet users. Turning to mobile-broadband penetration, the number of its subscriptions will achieve 2.3 billion globally. 55 per cent of them are expected to be in the developing world. As shown in the ITU statistics, mobile-broadband remains the fastest growing market segment, with continuous double-digit growth rates in 2014. In addition, Africa takes the lead in its growth, from 2 percent in 2010 to almost 20 percent in 2014. Compared to the spike of mobile-broadband, fixed-broadband, however, reflects slowing growth in the developing world. The ITU report expects its penetration to reach 10 per cent by end 2014. Similar to Internet subscriptions, Asia-Pacific region also dominates the most users in fixed-broadband, while Africa has the least, with lower than 0.5 per cent of its population. Regarding mobile-cellular, a significant step towards which subscriptions is that the number will reach 7 billion by end of 2014, with developing countries home to over 75 per cent among the users. This increase indicates the growing markets in the developing world. Even as the worldwide growth trend of these ICTs continues, fixed-telephone penetration, however, lags behind. According to ITU, fixed-telephone users have been declining for the last five years. In addition, there will be about 100 million fewer subscriptions than in 2009. ITU statistics are widely recognized as the world’s most reliable and impartial global data on the state of the global ICT industry. They are used extensively by leading intergovernmental agencies, financial institutions and private sector analysts worldwide. 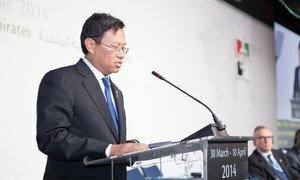 In the wake of the mysterious disappearance of Malaysia Airlines Flight 370 and the ongoing hunt for the plane, the head of the United Nations International Telecommunications Union (ITU) today committed the agency to the search for a real-time inflight communications system, drawing on new technology to help improve on the 50-year-old “black box” model.